Celeriac, or celery root, can look intimidating, but once you get past its rough exterior, it’s home to a mild root vegetable with a hint of celery flavor. 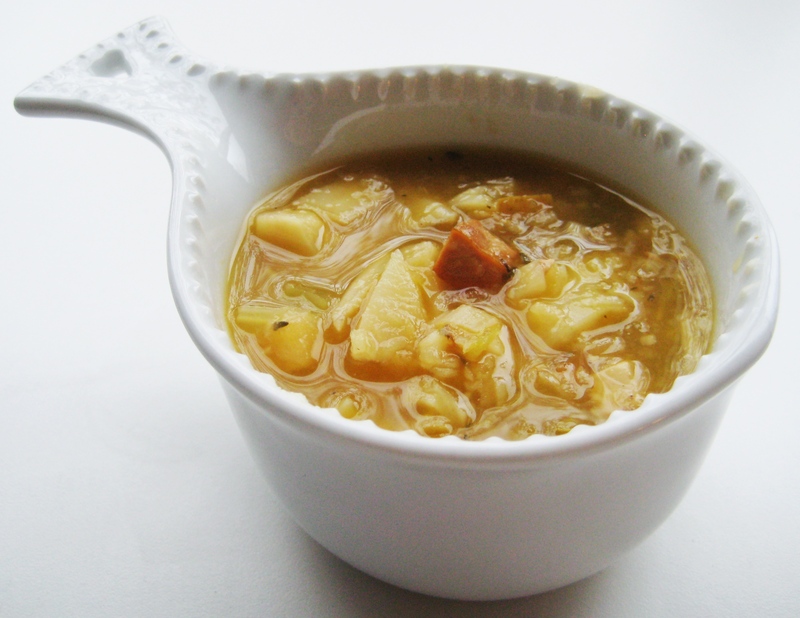 The apples, pears, and smoked tofu are the perfect complement for a warm, early fall soup. I love dunking pieces of soda bread or beer bread, which can be baked in a jiffy while simmering the soup. In a large saucepan, heat the oil over medium-high heat. Add the green onion, tofu, and celery. Cook until the vegetables soften, stirring occasionally and scraping up the bits from the bottom of the pan. Add a few splashes of the broth to prevent burning, if necessary. Add the apple and pear. Continue to cook until softened, about 5 more minutes. Add the celeriac, thyme, salt, pepper, and broth. Cover and bring to a boil, then reduce to medium-low heat, simmering until the celeriac is tender. If you have an immersion blender, pulse the soup about 5 times, to create some puree of the ingredients and add some thickness, adding additional water if necessary. If you don’t have an immersion blender, transfer about 2 cups of the soup into a food processor or blender, let cool slightly, then puree until smooth. Scrape the mixture back into the pot. Mix well, adding water if necessary. Test for seasonings. Serve warm. Hi Laurie – I’m looking forward to trying this recipe – just wondering which kind of smoked tofu (and where can I find it) and if you’ll be posting the recipe for beer bread – it doesn’t appear at the linked page. Thank you! Hi Karen! The Beer Bread recipe is in my book (The Allergy-Free Cook Bakes Bread). The smoked tofu is Soyganic brand — I buy it from Sobey’s (in town), Organic Garage or Whole Foods (out of town). Only places I have seen it! It is a Canadian brand. That soup looks great! I don’t think I’ve come across celeriac, I’ll have to keep an eye out for it. Not at all! Do not like. Celeriac is also called “celery root”. It looks weird and twisty and rooty.